On 27 and 28 October, Charter4Change signatories convened in London to discuss the Charter’s implementation and the next steps they would take to deliver upon their commitments to the localisation agenda. Endorsers of the Charter were also invited to contribute their views on the initiative, which took the form of a discussion on their priorities and where they would like to see the Charter focus over the coming years. Defining and categorising national and local actors (what does this entail?). Issues of partner capacity to implement the localisation agenda, in practice. Power dynamics between signatories, local actors and donors. Access to donors and institutional funding. Capacity strengthening support, particularly around financial systems and human resources. Establishing clear definitions on local actors and clarity over the relationship between northern and southern organisations, going forward. The signatories divided themselves into smaller working groups, to hold practical discussions, addressing each of the Charter’s commitments in detail. A summary of these discussions, challenges and suggested next steps can be found below. Terms of reference will be drafted for a Charter4Change steering group (to include the original core group of CAFOD, Christian Aid, Danish Church Aid and Local2Global, plus Oxfam and CARE). A reporting guidance group comprising of the core group mention above, in conjunction with CRS, Oxfam and WarChild. CARE and Oxfam will convene a meeting of signatory fundraising and communications teams. Oxfam and NCA will champion the advocacy to donors commitment. Local2Global, Oxfam and Trocaire will follow up with data capture and IT staff regarding IATI/reporting commitments. It was agreed to identify champions for each of the 8 C4C commitments, to take work on each commitment forward. An agreed meeting and reporting cycle (light touch, every six months) and an annual signatories meeting (to be coordinated around other key milestones and dates). A reporting template will be agreed. 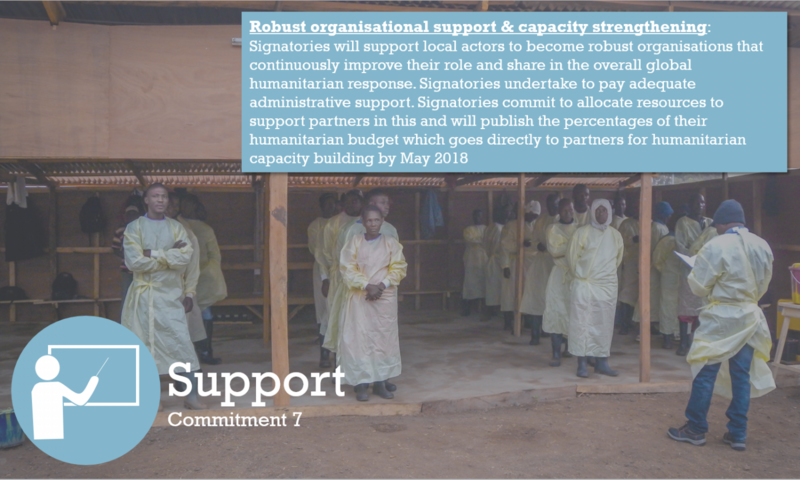 Charter4Change signatories also agreed to do more to raise awareness of the Charter internally within their organisations, and externally, raising its profile with partners, donors and their supporter base. Signatories will also continue to contribute resources, news and case studies to the Charter4Change website. For further details about the Charter4Change, its signatories or this meeting, please contact us at admin@charter4change.org.